Trekking Through Guyana and History. The word hackia comes from the Arawak language haküya and denotes trees of the genus Handroanthus, typically used for making tool handles. The hackia stick is a part of Guyana’s history and is made with any kind of dense, heavy wood, specifically that of the forest tree Ixora ferrea (family Rubiaceae) or of trees of the genus Handroanthus (family Bignoniaceae); especially (in later use) in hackia stick. When one thinks of walking sticks in today’s society, our first thoughts turn to canes and the infirm. But the walking stick is much more than an aide. Over the centuries it has been used for many purposes, from weaponry to clothing accessory. It has been a symbol of authority, as well as a decorative appendage. The walking stick has three main parts–the ‘handle’ by which the stick is held, the ‘shaft’ or straight part of the stick, a ‘band’ or ‘collar’ which joins the handle to the shaft if they are of different materials, a ‘ferrule’ or tip, and the ‘wrist cord’ for carrying. A ferrule was usually metal to protect the end of the stick. Sometimes, however, it was of a material that matched the handle, such as ivory horn, silver or gold. Before roads were paved, the ferrule was three to four inches long. In ancient Egypt, a stick was an object of prime importance. But while everyone had one, they varied by the person’s occupation. A shepherd’s staff was different from a merchant’s, whose was different from a priest’s or Pharaoh’s. The stick remained with a person even in death, when it was placed in the coffin beside the mummy to protect the deceased on his travels. The middle ages were dominated by the church, and this showed in the design of the walking sticks. The decorations were crosses and bishop’s crosiers. Some even contained hiding places for money, precious stones and secret weapons. European kings used canes or sticks as a symbol of authority. Many monarchs, such as Henry VIII and Charles I have their hands resting on sticks in their portraits. Louis XIV ‘wore’ his canes, and the court followed suit. (Although they could not be worn to court in the presence of the king.) The knobs and handles of many royal sticks were embellished with precious jewels. The hackia stick, was and to some extent, is still a part of Guyana’s cultural life. 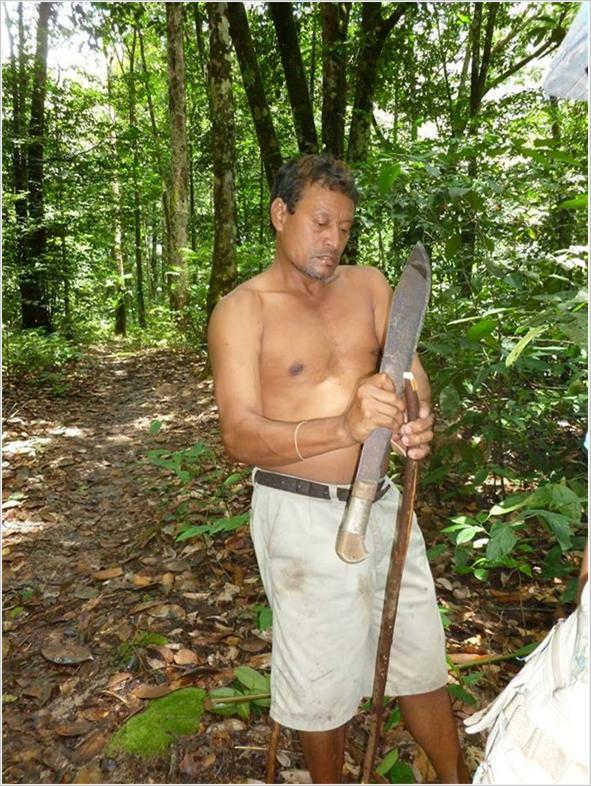 It serves as a good tool and weapon of Guyana’s countryside and villages of the hinterlands. There are countless stories made for the nights and rainy days of the thief- man or ole higue encounters with a hackia stick. It is a perfect weapon to have for snakes when trekking through the grassy and leaf- laden pathways of the journey around Guyana. The hackia stick remains a valuable aide and treasure of ancestry and will be around for a long time due to its practical application. Thank you for this article. My dad had a Hackia stick he was in no way infirm; is was more for style than anything else 🙂 He only used it on occasion. I do not know if my mom could not pronounce the name properly but I knew it as the “Ackia” stick. Thanks Walter, I just know it as Lemon grass. Some also calls it fever grass in Guyana.